TV Moore is an internationally recognised artist who lives and works in Sydney and New York. ‘TV Moore is Dennis Hopper from the film The last movie (1971). TV Moore is Joaquin Phoenix from the film I’m still here (2010). TV Moore is Mickey Rourke from the film Rumble fish (1983). TV Moore is TV Moore from the film Nina, me and Ricky Jay (2009),’ says David Griggs. ‘TV Moore is a friend and one of Australia’s most progressive artists: a mystery wrapped in a riddle wrapped in a smoke haze of acid night cowboy ghouls during a love story re-shoot. TV Moore is a Bulldogs fan, who can stay up all night and talk about Australian history while commenting at the same time on the importance of filmmakers like Werner Herzog. Griggs has studios in Sydney and Manila, where he has worked on-and-off for eight years. 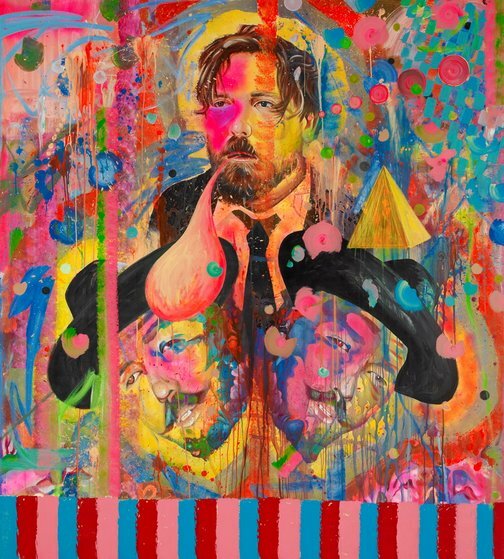 He was a finalist in the 2007 and 2009 Archibald Prize.